Luxury and opulence best describe the Trump International Hotel & Tower Chicago, also known as Trump Tower Chicago. The Trump Tower features 486 luxury condominiums — from studios to five bedroom penthouses. The adjoining Trump International Hotel has 339 five-star luxury guest condos for sale in studio, one, and two bedroom suites. 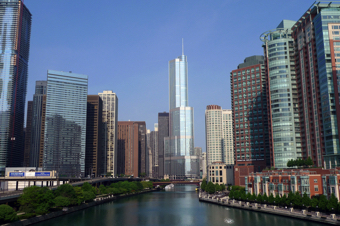 The Trump Chicago is located at 401 N. Wabash in River North, just steps away from the upscale retailers along the Magnificent Mile, the Chicago River, and the Chicago Loop business district. The 92-story stainless steel and glass building with a “curvilinear face” is home to retail space; a riverfront park and riverwalk; a 339 room hotel; fine dining and banquet amenities; residential condos; and a 1000 vehicle indoor parking garage with a resident-only section. See below for all Trump Chicago condos for sale, or read more about the amenities at this exquisite property. Interested in condos for sale at Trump Tower? Call or text us today at (312) 953-0961 to schedule a private tour of the building and any of its available condo residences on the market! Trump Chicago condominiums feature floor to ceiling windows with panoramic views of the lake, the Chicago River and the city. The ceiling heights range from ten feet in the standard units to sixteen feet in the penthouses. The gourmet kitchens are designed by Snaidero and feature Sub-Zero refrigerators, Miele cooktops and granite countertops, while the bathrooms feature limestone or marble finishes. Residents enjoy luxury hotel service, concierge, and room service — all available 24 hours a day. There are also in-home dining and catering services, housekeeping, laundry, valet services, and access to a world-class restaurant that has an outdoor terrace with spectacular panoramic lake and city views. The Trump Health Club and spa are located on the 14th floor of the hotel and provide state-of-the-art fitness equipment, heated swimming pool, exercise studios, and locker rooms with steam rooms and sauna facilitates. While listings vary almost daily, you can be sure to find the best selection of Trump Tower condos for sale, here. Not seeing anything you like at Chicago's famed Trump Tower? Start browsing more River North condos for sale, or contact us today at (312) 953-0961 for help with your Chicago home or condo search!